SandPoint Times - Winona Area Citizens Concerned About Silica Mining C.A.S.M. C.A.S.M. is a group of citizens in the City of Winona and in Winona County, Minnesota who are concerned about frac-sand mining and related operations in our region. Local communities on both sides of the Mississippi River have been caught off guard by the unbelievably sudden proliferation of mines and related activities. We need answers to important questions, and adequate safeguards must be put in place. We welcome your input and involvement in helping us protect the health, safety and welfare of citizens in the Winona area, while preserving this area's unique beauty, natural resources, and way of life. In Winona County, if you look along Highway 14 you will see frac sand on the nearby bluffs. Frac-sand is a specific type of sand and is not like regular sand, as this video shows. Frac-sand is ideal for use by the oil and gas industry for the type of drilling they call "fracking." But frac-sand dust is so fine it is invisible… and is known to cause breathing difficulties and silicosis. Take a look at the dust from a frac-sand pile in the second video. Frac-sand workers must wear respirators for their safety but what can residents and neighbors to these mining activity areas do for their safety? Is this as dangerous as asbestos or second-hand smoke? We didn't know the dangers of those particles, either... but people are dying today because of their exposure to these harmful air-borne particles. The sand mining activities in Winona are blasting, digging, processing, transporting (from ouside the county) onto city and county roads, and finally shipping out tons of frac-sand to Texas, Pennsylvania, etc., where wells are BIG business. We know what the mine owners are getting out of this--- $$$$. What does Winona get from this industry besides higher taxes (to replace roads), health hazards, and possible ground water pollution? Is this what we want from our elected officials? This first video is based on a letter from the oil and gas company that bought a large tract of land outside Red Wing, Minnesota. What facts do we know about the mining companies? Who owns the companies? Who are the partners investing in the business? These questions have been asked of the frac-sand mine within the city Winona, but have not been answered. Applications for mines within Winona County do not disclose who is behind them, either. Many questions in the video are answered with industry-speak. When engineers/consultants discuss a proposal and do not mention frac-sand until about 20 minutes into the presentation, are they being upfront with information? The messages we hear in this first video are ones we hear repeated by the mining industry in our area. For example, "there is no danger of de-watering," or "the water is recycled," or "we don't use any chemicals in the process…" What are these claims based upon? Ask for their sources and research. Don't allow them to be secretive. If these mining companies want to be good neighbors, it starts with sharing information and answering questions honestly. There is an active frac-sand mine within the city limits of Winona, Minnesota – the Biesanz Stone Co. Those who live in housing developments near this mine would like the following questions answered. These are questions that should be asked of all frac-sand mine owners. Why the new scale of work? Previously, this was a small family-owned business. Why this new intensity of blasting and shaking our homes? • Is it okay to shake our homes? • How many trucks per day are you planning to send out on our local roads? • How do you propose to pay for replacing roads damaged by the intensity and frequency of the frac-sand trucks? • How deep do you plan to mine? • What does this mean for our groundwater? • How much water are you removing from the water table? • Since the sand is a natural filter for our water, what do you think we can use to continue to filter our water once the sand is removed and sold? • Do you not care that so much frac-sand truck traffic makes us look like an industrial site? • What about the dust from trucks along the roadways? • What about the dust from the stockpiles at washing and transport sites? • Since the train cars are open, what about the dust released along the tracks? • What about emergency incidents at the mine? • One plan reviewed has "Call 911" listed first for the emergency plan. Do you think Three Mile Island had "Call 911" listed first? • Residential housing areas pay considerably higher taxes than do local mines. How can this be made more fair? • If housing values drop, the city will collect even less in taxes. Do mine owners have some responsibility to help both the city and the property owner? • You say you produce jobs, but how many go to local people? • How many are long-term full-time jobs, with benefits? 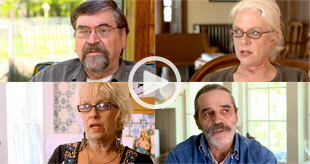 Video: Frac-Sand Mine Neighbors - Residents of Maiden Rock, WI describe what it's like to live next to a giant industrial sand mine that operates 24/7, producing sand for hydraulic fracturing, aka: 'fracking'. Last week, the city of Winona approved a one-year moratorium on silica sand operations – new or expansion of current facilities – at a minutes-long emergency meeting.